Liminoid is a wearable electronic system that induces an augmented and virtual experience of disintegrating subjectivity. The system is constructed of three body extensions. The first extension is Oculus Rift: a next-generation virtual reality headset primarily designed for immersive gaming. The artists have hacked and extended these virtual goggles by equipping them with a pair of web-cams to ensure a hybrid experience of virtual and augmented vision. The second extension is an open source hardware Pulse Sensor Amped measuring heart-rate beats per minute for Arduino. The third extension is a panoptic camera overseeing the exhibition space and is incorporated in the dramaturgy of the visual experience. 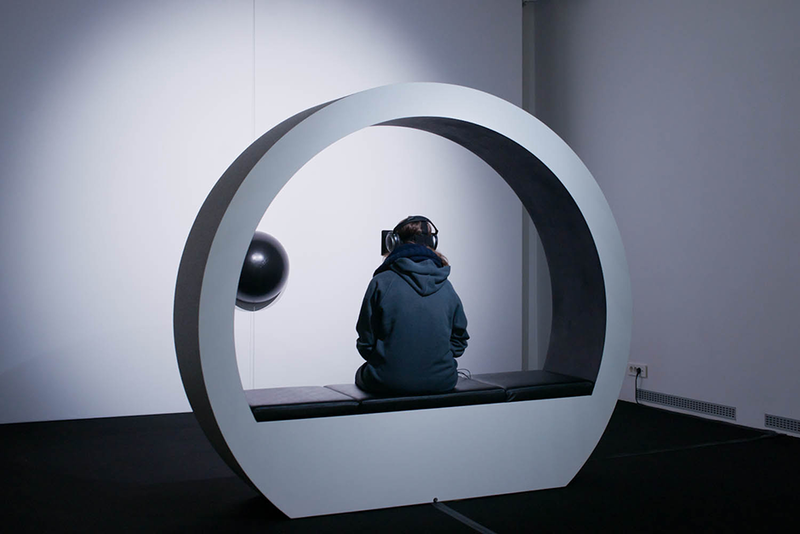 The visitor is seated in a comfortable chair, preventing a physical reaction to the immersive experience, which might result in disorientation, dizziness or even nausea. The geometric radiolaria-like shapes for virtual and augmented video experience have been constructed in Blender, a free software for 3D modeling, while the animation is responsive to the pulse of the visitor and has been coded and published at github to support open source communities and free accessibility to the results of the research on GitHub. In the context of anthropology, the term liminoid has been coined in order to describe the contemporary experience of the liminal stage of transience of the selfhood in the rites of passage. A liminoid experience thus defines an undetermined set of rules that triggers transformation of the sense of self. Much like liminality the liminoid experience is achieved through a three-phase passage from the separation from the old self, to transition phase that is characterized by ambiguity and disorientation, and last but not least the phase of incorporation and formation of new perspectives. This three fold experience is reflected in the dramaturgy of the visual experience in the virtual / augmented headset, however the artists do not simply translate mental processes by visual means. The project is not merely a simulation of the liminoid stage. It offers a number of augmented and virtual twists, thus becoming above all, portray of the poststructural concepts like disintegration of subjectivity, the becoming, the virtual, the immersion and identification. The experience is intense and even rather unpleasant sensation of uncertainty, anxiety or even existential fear. The liminoid is the potentiality, and the viewer is out for a surprise! By engaging the viewer in this mental process, the artists have given the term an extended meaning. The liminoid in their installation is in fact the viewer who becomes a liminal android, an illusive organism that becomes pure form for transition. The virtual space offers an endless multitude of forms and folds, it appears both everywhere and nowhere at the same time, thus this space is inherently liminoid. The “pure becoming without being” in the virtual space is the ideal place to experience the modes of appearance and disappearance of the idea of the self. The interface becomes the form that rises to the surface, but needs no materiality for the mental images that appear in a sort of three-dimensional environment that possesses certain properties in common with the real space, but is not predominated by them. To further this notion, the basic bodily function become the generators of the visual shapes in the installation. The pulse sensor transmits visual projections of human heartbeats that may be used to induce an “out-of-body experience,” according to the Swiss Federal Institute of Technology in Lausanne. Their research has proven a correlation between the virtual representation of the heartbeat via an avatar and the formation of empathy that promotes the treatment of self-perception disorders. The rhythm of ones heart visualized in an immersive environment induces the sense of identification and connects the person with oneself. This forms a holistic approach that views the sense of the self as a cocktail of social, environmental, sensory and hormonal factors. Contrary to the traditional society, there is no fixed position for the sense of self. It is in constant becoming, conditioned by the entirety of the human experience. In the dramaturgy of the generative video experience, the folding of the subjectivity is represented by a concentric shape resembling radiolaria; a protozoa that produce intricate mineral skeletons. The constant fluid folding, unfolding, and dispersion of the geometrical shape is an esthetic representation of our temporal and spatial configurations that produce new modes of subjectivity. The point of (dis)orientation becomes a deep, dark dimension that allows us to lose and recuperate ourselves. Liminoid as an interface for human liminoid experience is a product of computer generated synthetic images and sound, but the effects depend on our personal notion of timespace. Saša Spačal is an intermedia artist and a graphic designer with background in humanities, who has expanded her knowledge of computer graphics, web and video production at various workshops. She is currently working in the fields of graphic design, real-time interactive visualization and intermedia art, trying to connect various technological and biological organisms. 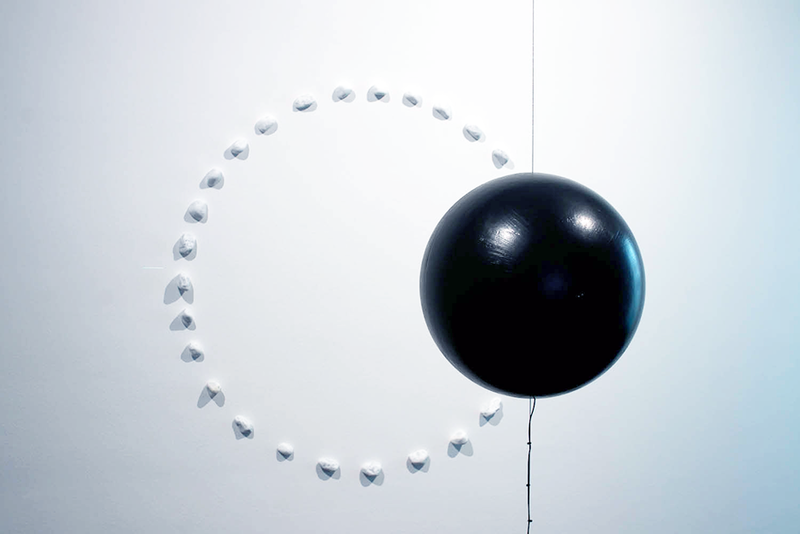 She has taken part in exhibitions and projects in Moderna galerija, Galerija Škuc and Galerija Alkatraz. As a member of Temp group she had participated in public interventions and installations, in the development of strategies for alternative use of abandoned spaces, and in exhibitions Odprti Rog, Pogovarjanja/Conversations/Conversas, Mapiranje/arhiviranje/analiziranje izginulih prostorov umetnosti. As a researcher, she had taken part in the international research project Performing the City. Art Actionism in Public Space in 1960s/1970s that had made its rounds in Munich, Naples, Sao Paulo, and Paris. Her interactive installations were presented at various international exhibitions and festivals such as Haip festival – Ljubljana, Enter 5: Datapolis – Prague, AmberFest’11: Next Ecology – Istanbul, De:sonanz 2012 – Skopje, Device_art 4.012. – Zagreb, Device_art 4.013 – Prague and Enter 6: Biopolis – Prague. Currently she is developing several new projects that focus on interfaces between living and technological organisms in collaboration with Kapelica Gallery, Multimedia Center Kibla and Ljudmila – Ljubljana digital media lab. In the field of interactive visualization and sound design she is developing strategies for usage of physical interfaces for generating sound and visuals as a member of Theremidi Orchestra. Together with Ida Hiršenfelder she is developing ČIPke platform, an initiative for researching the conditions of women who are active in the context of science, technology and media art. ČIPKe platform will open a space for conversation about women working in these fields and try to form a women friendly hackerspace with practical educational programs. Matic Potočnik is a programmer with an interest in new media art, especially mixed reality and game development. Currently he’s finishing a masters-equivalent degree in computer science at the Faculty of Computer and Information Science, University in Ljubljana. He keeps busy with developing and analyzing software, watching science fiction movies, and with excessive use of internets. He has worked alongside Dominik Mahnič on project Lumen – Drawing in Augmented Reality, which was presented at Kiblix 2011, Alkatraz gallery, Škuc gallery, and at Device_art 4.012 in Zagreb. He has also collaborated with Dan Adlešič and Tilen Sepič on Form From Form, a mixed reality project, which was set up in Galerija Vžigalica for the festival Svetlobna Gverila (Lighting Guerrilla).